Acronyms for Happiness – A 10-Minute Play! Another of my 10-Minute Trafalgar24 plays. This is my fourth Trafalgar play. For the past four March’s, I’ve taken part in the Trafalgar24 Play Creation Festival at Trafalgar Castle in Whitby, Ontario. The playwrights get locked into the castle overnight for 8-hours. Each of the 6 playwrights must write a 10-minute play which takes place in the room in which they are placed to write them. Each playwright gets head shots of their actor(s). After the 8 hours are up, the actors and directors come into the castle and the writers leave. The actors and directors then rehearse the 6 plays for 8 hours. Later in the evening, the audiences arrive at the castle and they travel in groups to see each of the six plays throughout the castle. So, each play is performed 6 times. This is a wonderful event…always a perfect evening of entertainment. After doing it for 4 years, I am still gobsmacked seeing the actors perform these plays to perfection. Amazing time! Mark your calendars…it’s a NOT TO BE MISSED event. Here’s my 2012 Trafalgar Play! SYNOPSIS: To attain happiness, Ann is willing to do anything…while Kelly will stop at nothing to save her. ANN : Flighty, New-Agey, Dreamer. DESCRIPTION: Ann is a career dream-chaser. Her co-worker, Kelly, has a healthy dose of skepticism. Can Kelly save Ann from falling into this newest bottomless pit of false hope she is getting herself into? ANN: [Sitting on a stool by the island sink, head down on the desk][Sings…dreamily, hopeful but trailing off] …why then, oh why can’t I? KELLY: [At the microscope, examining. Looks up.] Because. You’re hopeless. You’re about as useful as angels in a bar fight. That’s why you CAN’T. ANN: [Lifting her head. Pouty.] You don’t believe in me. You shoot down every single ambition I ever have. You’re a killer of dreams. KELLY: [She has been mimicking Ann the whole time. Looks back into microscope.] Yeah, well. That may be so, but at least I know how to dream. ANN: What’s that supposed to mean? KELLY: It means you’ve always been impractical, Ann. You always believe in the impossible just long enough to get your heart ripped out when you discover that it actually is impossible. KELLY: It’s different. I know. ANN: This time [Gets up and moves toward the other sink] This time I have a flawless plan! If you can dream it, you can be it. If you can dream it, you can be it. [Picks up mortar and pestle and starts walking towards audience.] Guru Les says mantras can change the universe! If only one believes. KELLY: Oh, you mean Guru Les-is-More? Guru Les-Money-in-Your-Pocket-is-More-Money-in-Mine? That Guru? KELLY [Dings the bell beside microscope several times.] Whoa, girl! Slow down. Rein it in. ANN: [Stomps back to Kelly’s side.] Squasher. Of. Dreams. KELLY: Let’s think this through. Break it down, shall we? What’s your dream this time? KELLY: And this Guru Les-is-What-You’ll-Get-if-You-Follow-Me, this guy you’re always talking about like he’s God’s gift to, well, Gods. He’s helping you to attain this…this…nothingness that is a non-specific-ish dream? KELLY: Really? I was mocking you. Somebody needs to tell you there’s nothing behind curtain number one. ANN: It’s my dream box. Guru Les gave it to me. Isn’t it beautiful! ANN: Why, nothing. Duh! It’s for my dreams. To collect them all in one place. KELLY: [Rolls eyes. Shakes head.] So he gave you an empty box? Wow. Luck y you! How much did that cost? Two hundred? Look. I’m happy you dream. Really, I am. How long have we worked together? KELLY: I’m just saying, I’ve known you long enough. Maybe you’re going about things the wrong way, is all. Who’s this Guru Les-Insightful-Than-a-Doily guy, anyway? I mean, who is he really? He’s just a guy in pajamas tryna get all your money. Right? Am I close? ANN: Well, I’m not one to nitpick, but casual comfortable yoga gear is not really the same as pjs. KELLY: Okay. Whatever. This Guru Les-Clothes-Allows-Me-To-Take-Advantage-of-You guy. He charges money, right? KELLY: Oh, right. The dreams again. Well, if you’re going to be barking at the moon in pajamas, you might as well be dreaming too, right. ANN: One does not sleep in one’s yoga wear. KELLY: And yet one can dream in one’s yoga wear. Interesting. Let me ask you this. If you were to pinpoint one dream. Just one, mind you. What would it be? What is your deepest desire? ANN: Oh! You mean ‘Dream it—Be it’. ANN: Visualization of your wildest dream. That’s what Guru Les calls Dream it—Be it. It’s so funny. He always says TM after he says it. You know, with air quotes and all. KELLY: Riiiiight. So this Guru Les-of-a-Guru-Really-Than-a-Fortune-Cookie guy, he tells you that if you could dream it you could be it? Simple enough. What’s your biggest dream? ANN: Duh-duh-duh-duh [Hums the wedding march and dances dreamily out in front of the audience.] Oh, you know. Kids. A husband—A striking, handsome husband. I’d say Prince Charming, but you would probably laugh at me. KELLY: No. No. I wouldn’t laugh. [Picks up the heart from the shelf above sink.] I do have a heart, Ann. ANN: Cute. I get it. A heart. Cute. [Still lost in wedding dream, still pirouetting and dancing] I guess this would be a really bad time to tell you that Guru Les held his Name Choosing Ceremony last night. ANN: Choosing ceremony. [Stops dancing] I told you it was coming up soon. You don’t listen, do you? KELLY: I do try not to get any of this Guru Les-of-a-Nutbar-Than-a-Fruitloop guy on me, if you know what I mean. Sounds like he could be catching. ANN: Well, anyway. Before we can focus on our Dream Retrieval Therapy—DRT—we need to choose and own our new names in the Name Choosing Ceremony. NCC. KELLY: Dream retrieval, what now? ANN: Don’t give me that look. I chose Penelope-Beatrix. I feel it lifts me. [Pirouette.] Prepares me for my dream. KELLY: Sweetie, if your dream is a month-long vacation in a padded cell with all the noodles you can eat with a nice soft spoon, then you may be in luck. ANN: Guru Les warned me there would be doubters. People who wouldn’t believe in his theories and methods. For those people, he gave me the Dream Stealer Mantra. DSM. I just didn’t think I would need to use it on you! KELLY: So this Guru Les-Brains-Than-a-Shoehorn guy, he gives you mantras to ward off the sanity of friends? Does that not sound somewhat flawed to you? KELLY: Whoa, whoa! Don’t hit me with that mighty mojo! Don’t know if I can fend this powerful stuff off! ANN: Penelope-Beatrix just wants to find a husband and have a family. That is her dream. Why must you kill it! KELLY: Ann, I have no intention of killing your dreams. That’s a good dream to have. But how is pinching off bliss loaves with this Guru Les-About-Dreams-and-More-About-Schemes guy going to help you achieve this particular dream? ANN: You have to stop doing that! KELLY: Doing what? What am I doing now? ANN: You’re making fun of Guru Les’s name. It’s disrespectful. KELLY: Sorry. Sorry. But Guru Les-Than-Stellar is not impressing me much. I’m afraid you’re being taken advantage of. You’re always trying to chase the next thing. This guy is leading you down the garden path. KELLY: Whoa! What are you doing now—are you smudging me? Stop it. Back off! ANN: I’m doing the Naysayer Cleanse Ritual. NCR. Your negativity may metastasize to me. I need to protect myself against your chi. KELLY: What’s gotten into you? I’m concerned now. Seems you’re riding the crazy horse with this Guru Les-Functioning-Than-a-Rock guy. What’s wrong with just being you? Just letting nature take its course? You’re going to find someone, Anne. You’re a wonderful person. ANN: Don’t you see? I need an edge. I don’t want to be a lab tech forever. I want to meet Mr. Right. KELLY: What happened to strong independent woman? ANN: SIW? I don’t think I’ve ever heard of that one? KELLY: Jees, Ann…it’s not an acronym! It’s what we are. It’s what we used to be. What I still am! ANN: I have a dream. I want more. Guru Les could be the answer I’ve been looking for all this time. KELLY: If you ask me, this Guru Les-Answers-and-More-Questions guy is just that. A great big mother of a question. You need to get away from him. ANN: When I close my eyes I dream of fishes. ANN: Fishes. I dream of fishes. Do you understand how disheartening that is! 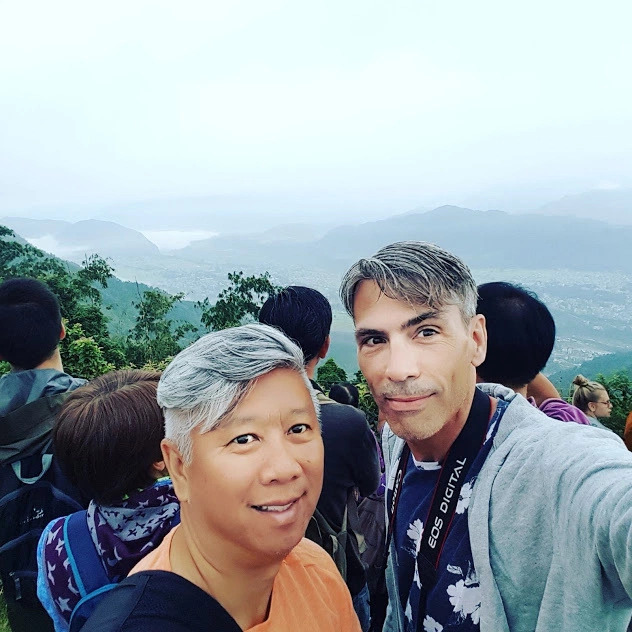 KELLY: What does that have to do with Gurus and dreams and husbands? What are you talking about? ANN: Don’t you see. I don’t wanna be alone. I don’t want to be the girl who only ever dreamed of fish. I want to close my eyes and dream of birthday parties and sandboxes and runny noses and doctors’ appointments. KELLY: Guru Les is not going to get you there. ANN: I need to be fulfilled. I need to belong somewhere. If wishes were fishes I’d be dreaming of babies. ANN: You know what I mean. KELLY: It’s time to go home. Time to call it a night. Please. Do me a favour and stay away from your Guru tonight. ANN: But we’re supposed to be Deep Dream Channelling tonight. DDC. It’s the last step before our Dream Retrieval Ceremony. DRC. KELLY: Oh, I’m sure it is. Come on. You’re coming with me. We’re going to try a little GNO. Tonight, we let go of the guru and take back the power. ANN: GNO? I don’t think that acronym is Guru Les approved? KELLY: No. But then again, Girls Night Out isn’t really something that would benefit this Guru Les-Appropriate-Than-a-Meat-Dress, now is it? Now let’s get out of here. ANN: But my dream. I must follow the procedure set out by the Guru. I’m not even in my yoga gear. How can I attain my dream if I can’t stretch comfortably. The Reasons – Novel Number Three! 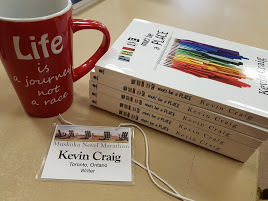 I wrote THE REASONS at the 2008 Muskoka Novel Marathon. It was my second marathon, and my first 72-hour marathon (The previous year, I did the 48-hour marathon and wrote Sebastian’s Poet). I had such a great time writing The Reasons. It was the first time I ever wrote a story in 2 POVs. I alternated chapters. It was all first person – First chapter was in Tobias Reason’s POV and the second chapter was in Maggie Reason’s POV. And it went that way for the entire novel, alternating from Tobias to Maggie. They are mother and son. And such a polar-opposite pair. It was such an incredibly fun experience to switch from one to another. What would you do if the police showed up at your door to inform you your daughter has died in a car accident? Maggie Reason beats up the officer who shows up at her door and insists that her daughter is alive and well. She then spends the next several years imagining Deja to be a part of her everyday existence. But Maggie was crazy long before Deja’s death. Her middle child, Tobias Reason, knows this all too well. He attempts to raise himself and his younger sister, Marcy, while Maggie communes with her dead child and spirals out of control in a confusing existence she desperately attempts to make sense of. Throw in the self-centered father, David Reason, who lives across town in hiding from his insane ex-wife, and Tobias has his job cut out for him. On a whim, Maggie takes the Reason children on a cross-country trip, but decides to leave twelve-year-old Tobias at a gas station in Quebec to see if he has what it takes to find his way home to Ontario. When Marcy hits her teen years, it appears she may be suffering from the same illness that has befallen her mother. When she suffers a breakdown, Maggie doesn’t come to the rescue. On the contrary, she sees the breakdown as her opportunity to make a move on Marcy’s live-in boyfriend. Things go well until something about the boyfriend’s seduction triggers a buried memory for Maggie, sending her into a tailspin that causes the boyfriend to flee the family for good. When Maggie’s mother, Althea Trick, dies, she leaves her house to Maggie. Maggie hands the newly inherited property over to Tobias, as she wants nothing to do with her mother—living or dead. Tobias, never having known his grandmother, chooses to learn about her by exploring the house. In his search he finds paternity papers for Marcy, proving she is the daughter of his grandmother’s ex-boyfriend. He confronts his mother, who loses her mind upon discovering the news. After her reaction, the only other thing he can do is confront his father, who tells him Maggie was raped by the man and that he had kept the results of the paternity test from her—worried about the strain it would have on her sanity. In his constant efforts to clean up after his mother’s messes, Tobias quickly convinces himself he must kill the man who has done this to his mother. He visits Leon Reynolds with the intention of killing him. His only problem…he likes the man. In the end, he knows he cannot take a life. But there are other ways to make people pay for their mistakes. Sometimes it is harder to live with what you have done than it is to die for having done it. And there are other ways to save the honour of your crazy mother. The title says it all. I just spent the last 9 years or so repeatedly kicking a gift horse. In the mouth. Why would I do such a thing? I can think of a zillion words that describe my writing journey. And knowing that each one somehow belongs to me makes me feel more than a little ashamed of myself. Let’s give it a go, shall we: apathetic, detached, indifferent, remote, withdrawn, lackadaisical. I think you get the picture. BUT…there’s a big but. The actual BIC writing time—I am always serious, always attempting to do my best. I don’t slouch when it comes to the writing. That’s the part that allows me to escape. I have always honoured it as much as I could. But, ACK, the business end. The getting things done end. I’ve been so weak. So nonchalant. Ooh, there’s another good word I must claim. No more, though. I’ve come to a point in my writing life where I feel I have to force myself to connect, to stop detaching. To own my writing and respect it…to see where it will go beyond me. The first couple of novels I wrote…I’d get some kind of extreme pleasure deleting them. It was the writing I longed for, not the result. It took a long time for the result to mean anything. It just felt like I was done, once I got the story out. With two books published, I’m finding a small bit of confidence I never in a million years imagined I would have. With seven or eight more finished novels on my PC, I have come to a point where I feel I should stop kicking that horse. I need to take this more seriously. I need to edit, revise, respect—those manuscripts can sit there rotting, or I can give them the time they deserve and clean them up and send them along their merry way. What’s the worst that can happen? A vow to myself. Respect the hours of hard work that I put in…by taking the next step when I have a completed manuscript. See things through. Stop detaching from everything. Writing has been very very good to me. It’s time to take the foot out of the horse’s face and give it a little pet. Horses won’t stand there forever and allow a person to keep kicking them. Sooner or later, the horse is gonna say, “Screw it!” I don’t want it to come to that. I want an amicable relationship with this horse. Time to put my foot down and get down to business! 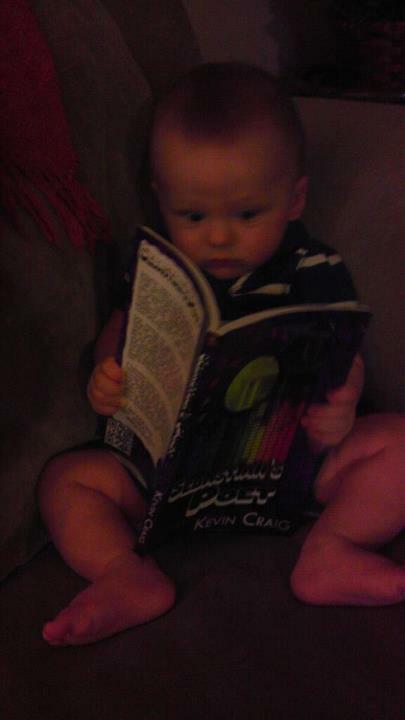 My grandson, enjoying my latest published book, Sebastian’s Poet!